Did I say the traffic was bad in Bali? Did I say it was chaotic in Yangon? Welcome to Mandalay, where I spent the bus journey to our hotel with my head frequently in my hands, convinced that we were going to kill or be killed. And those in my group who have been to Bangkok and Hanoi tell me I ain’t seen nothing yet. Hopefully by the time I reach those destinations I will have mastered the art of simply walking into the road holding my arm out and believing the cars and bikes will stop or avoid me. I am a bit done with the group touristy thing so have given myself a day off from my Burma family today and am currently sitting in my hotel room plucking up the courage to take my life in my hands (sorry, I mean go for a walk around the city). I left the last blog expressing my excitement for the balloon ride and it certainly didn’t disappoint. It was the most mind-blowing experience, ever. 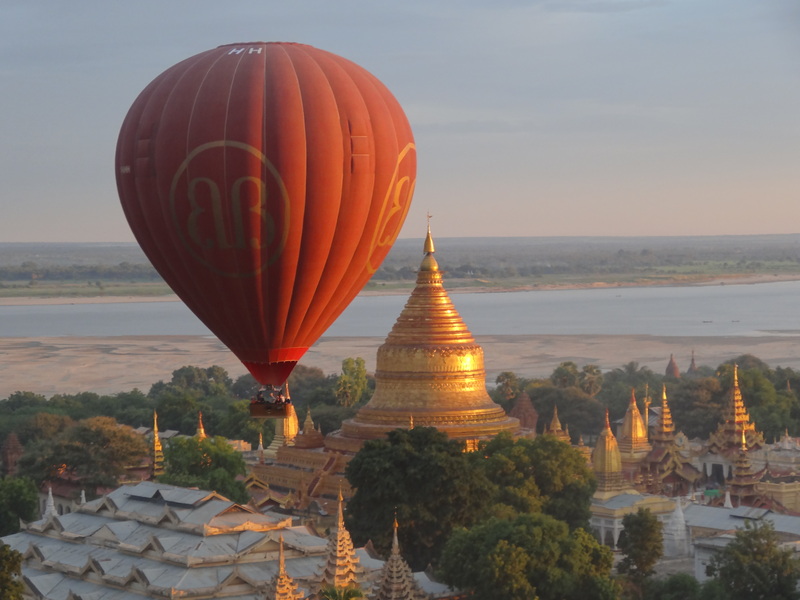 Our pilot said that flying in Bagan is one of the most sought after locations for pilots after Africa, and I can understand why. 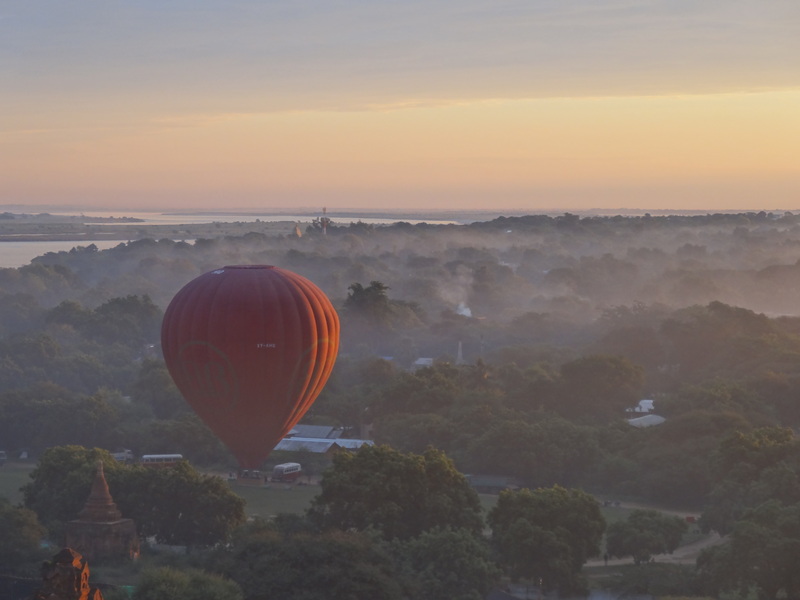 Bagan is home to thousands of ancient Buddhist pagodas, temples and monasteries and the sight of it from the air is haunting and beautiful in equal measure. Hopefully the pictures speak for themselves (frustratingly I cannot upload anything at the moment so that will have to follow when there is a better wifi connection). The flight itself (my first time in a hot air balloon) was brilliant fun – an extremely serene way of travel, assisted by the view and the champagne on landing, although at 7.30 a.m. that was perhaps a tad early to have the second glass that we did. Sadly shortly afterwards I succumbed to my first tummy bug of the trip, and lost a day curled up in my hotel room, in severe pain and fantasising about being at home in my lovely big bed with associated home comforts (At this point I would like to thank my sister for her moral support which largely came in the form of “man up Prosser”). 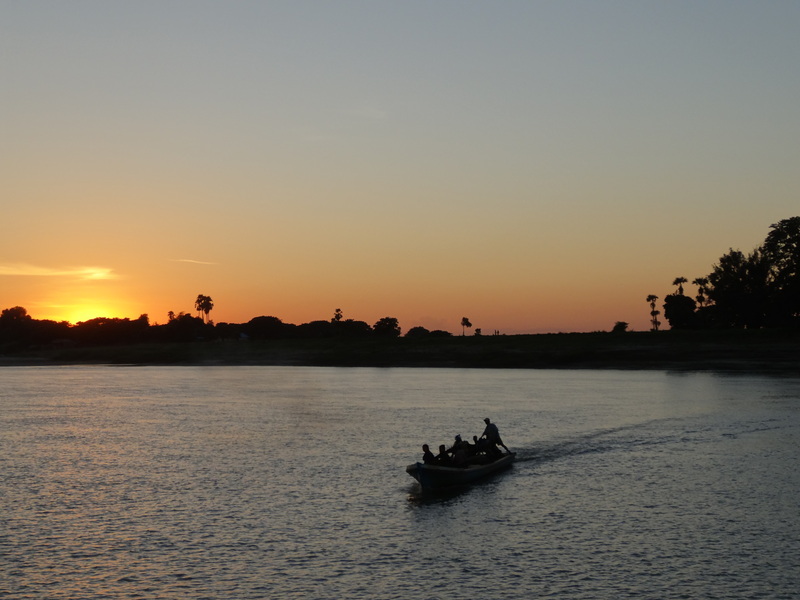 Thankfully that hit me the day before we embarked on a 36 hour trip from Bagan to Mandalay down the Ayeyarwady river, on a boat which we were all grateful at least had a toilet of the sitting variety, because it didn’t have much else. 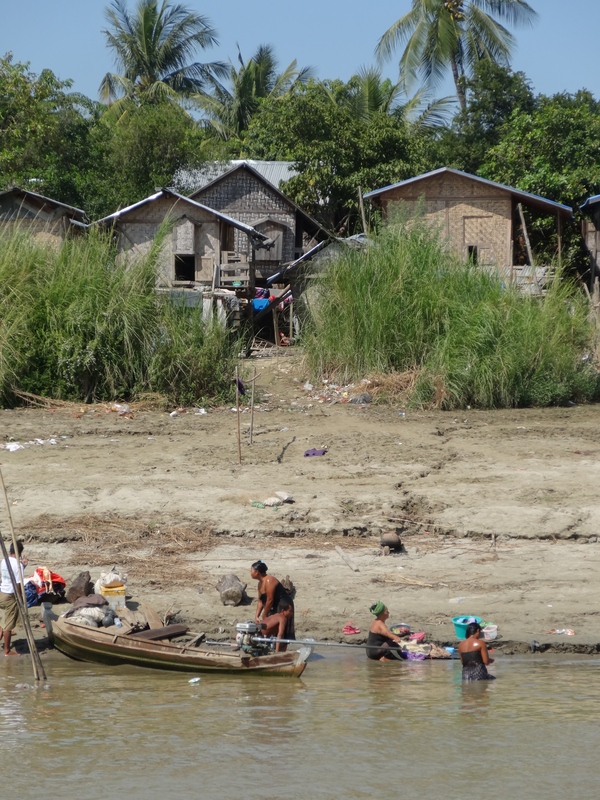 It was a lovely way to see life along the river banks – although again, when you see villagers washing in river water that is so dirty it makes the Thames look drinkable, it reinforces the enormous differences between people’s lives in this country. We moored up for the evening along a deserted bank and spent the night sleeping under the stars, at which point my supreme ability to overthink things struck again. I was woken around 2 a.m. by the sound of a couple of boats coming up alongside ours with men jabbering away to each other in Burmese as they flashed their torches along the length of our boat. Pirates, obviously. After they moved on, I fell back asleep and had such a vivid dream about having our belongings stolen whilst being assured no one was going to get hurt that I had to properly wake myself up before I could accept it wasn’t really happening. (In my defence, I would like to point out that I was not the only person slightly perturbed by this early morning visitation. 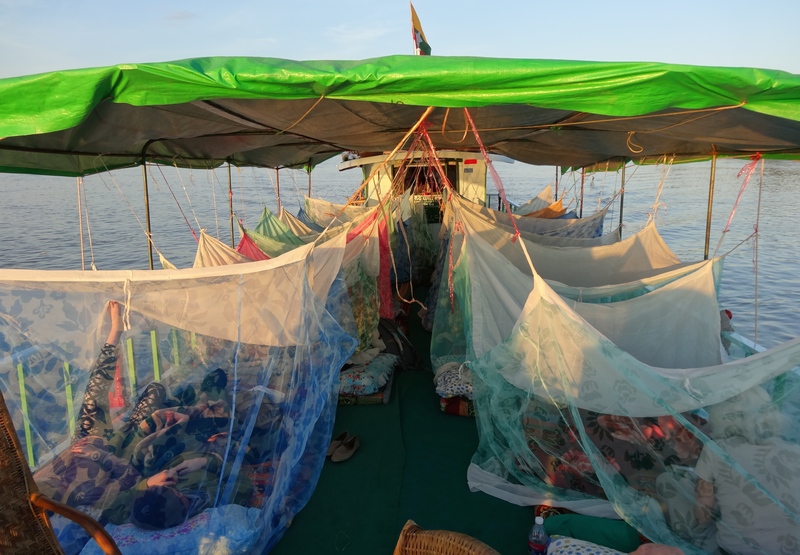 We were assured the next day that it was just local fishermen but I still reckon we all looked so rough under our mosquito nets that they decided we weren’t worth kidnapping). 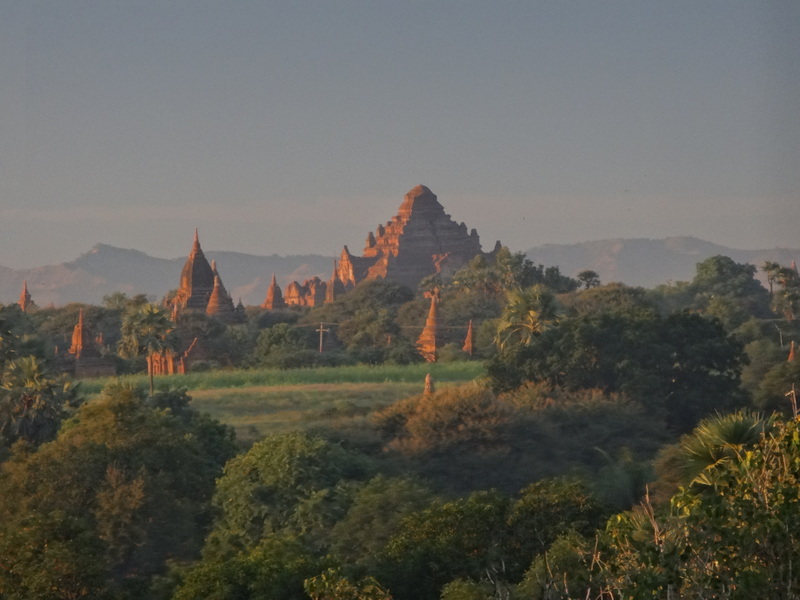 And so on to Mandalay which is….a city. 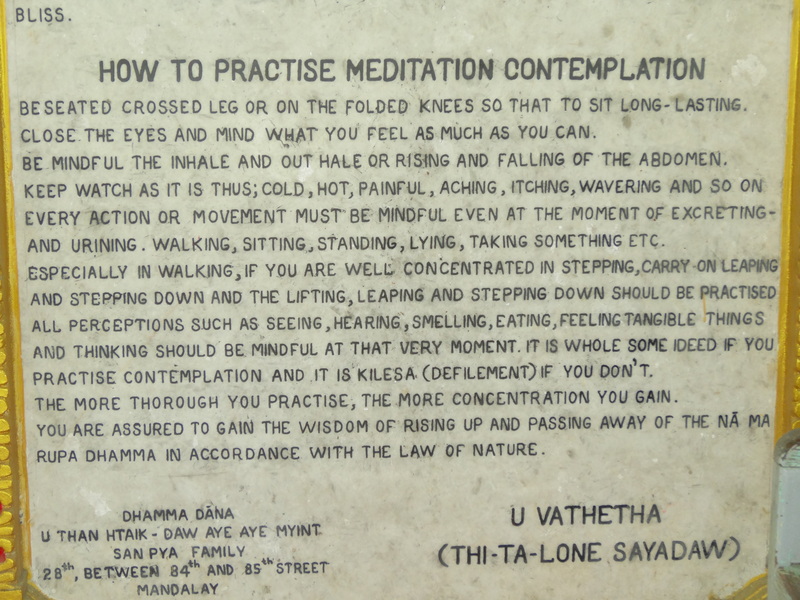 We stopped off at Sky Hill, the centre for Buddhism in Burma. [4 hours later]……as ever, poor wifi prevented me uploading so am trying again, having survived the walk! As for that walk….. what do you do if you ask 2 people which direction you need to walk in to get to your destination and they each point in the opposite direction? Well, those of you who know me well will have correctly predicted that I chose the wrong direction and spent half an hour walking that way before I realised! But I am glad I did as I went through some lovely roads before hitting a dead end and, knowing that shouldn’t have happened, turned round to retrace my steps, or at least thought I had until I ended up somewhere completely different again (no surprise there)….but an hour or so later found my destination having walked aimlessly around, laughing at myself for being so hopeless but at the same time mastering the art of road crossing (just step out with confidence and keep walking, people drive round you!). Bring on Hanoi. I found a café with great internet connection and wished I had taken my laptop so I could have actually tried to upload this with the photos I am so desperate to attach to illustrate my points. It then dawned on me that the fact it was super fast wifi meant that the place I was in was likely to be government backed – not a good thing for the local economy or my social conscience, so I hurriedly sent some messages from my phone and then left. As I walked back I realised the road I was on was completely different from others – large houses, nice cars, gated compounds, I even spotted some military uniforms – confirming my suspicion that I was in a more well-heeled, but perhaps less democratic, area of the city. That notwithstanding, Mandalay has charmed me. The streets are wider, tree-lined, boulevard-esque in comparison to Yangon (though remember, everything is relative), the people are more friendly – every time I stood on a street corner like an idiot trying to work out where I was, someone would approach me, unprompted, with a smile and tell me where I was. There are fewer hawkers, and there is more of a cosmopolitan feel to it. But then maybe when I go back to Yangon next week I may feel differently about it, and my first few days were just such a shock to the system I was never going to adapt immediately. Tomorrow we travel back to the countryside in Kalaw, and then on to Inle Lake, promising fresh air and more great sights and maybe even a wifi connection that allows me to upload pics. Although that is unlikely – it is amazing what we take for granted in our world. Having said that, I posted a card home to my parents from Yangon on 29th October and it arrived today, 4 November so that is pretty speedy. If only the internet matched it….